If you’re a Buddhist living in Japan, you now have the option of having a tiny white robot presiding at your funeral in lieu of a human priest. Japanese plastic moulding and funereal services company Nissei Eco will offer the robot Pepper in a Buddhist priest’s robe as an attendant. It will be able to chant sutras and livestream the ceremony. 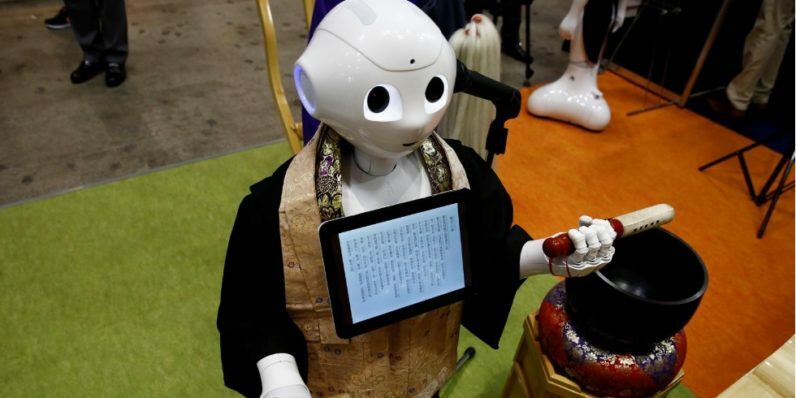 Pepper — a product of Softbank Robotics — debuted its new role at this week’s Life Ending Industry Expo — a funeral fair in Tokyo. The reason for this fusion of the spiritual and the technical? Money. According to The Japan Times, renting Pepper for funerals costs less than would hiring a human priest, and some temples are strapped for cash thanks to an unstable form of community support. Shrinking and aging communities have forced human priests to find other careers to support themselves, a Nissei Eco executive told Reuters. I’m not a Buddhist, so I doubt Pepper could preside over my funeral. But I think, if you have the option of having your last earthly hurrah led by a robot, why wouldn’t you? We’ve contacted Softbank Robotics about its child’s foray into spirituality, and will update if we receive any comment.